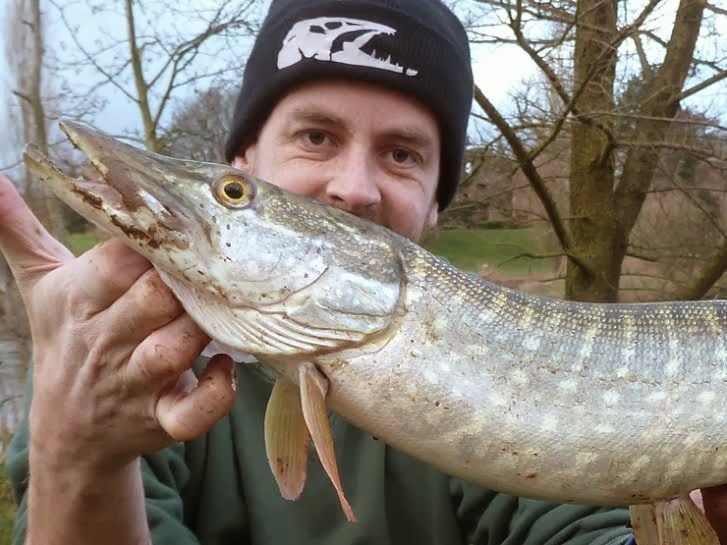 "Can you keep an eye on my rod while I have a look at the next swim" - I said, I was only away for two minutes, but it was enough time for Paulos to hit this fish on my kit... He said he felt guilty... I'm not sure I believe him! Bank high and virtually impossible conditions, but we hit the riverbank anyway... It was a long shot, no fish but at least we managed to wet a line! I did take a bunch of photos but to be honest I'm sick of looking at flood photos. Water had dropped back another 2 or 3 foot revealing a few slacks. Hopes were a lot higher today! 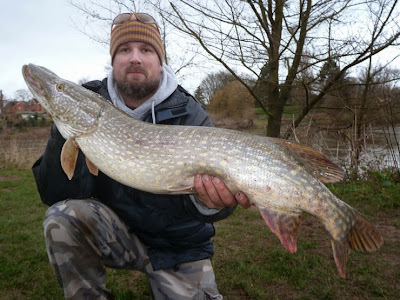 It was about 3 hours and a few dropped runs before Paulos connected to a fish, the pike we were after, about 5lb - both of us were delighted. About an hour later, after no further action, I decided to have a look for another slack. I asked Paulos to keep an eye on my rod while I had a look at the next swim. As soon as I left I had a run, Paulos did shout but I signaled him to hit it - we didn't want a deep hooked pike. A 16lb 12oz pike (top photo), I picked the wrong moment to step away! I cast back out and was rewarded straight away with another run... My turn... A 3lb jack! 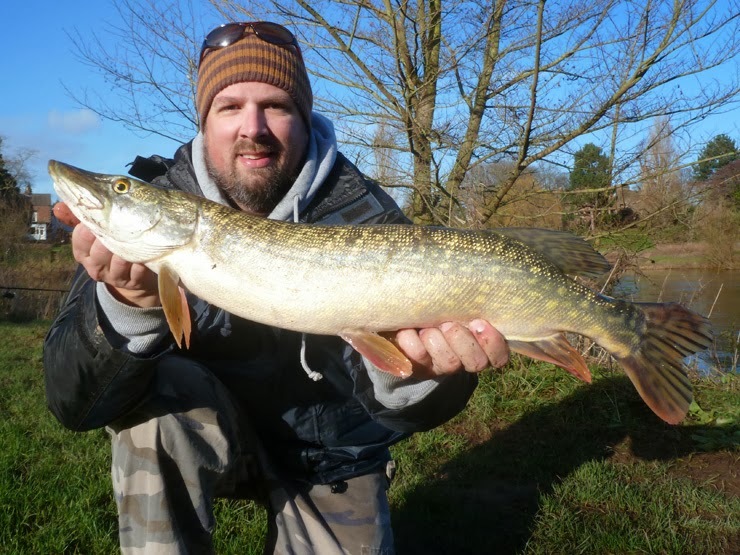 Next up Paulos was into another double, great fight and a 16lb 1oz pike was in the net. 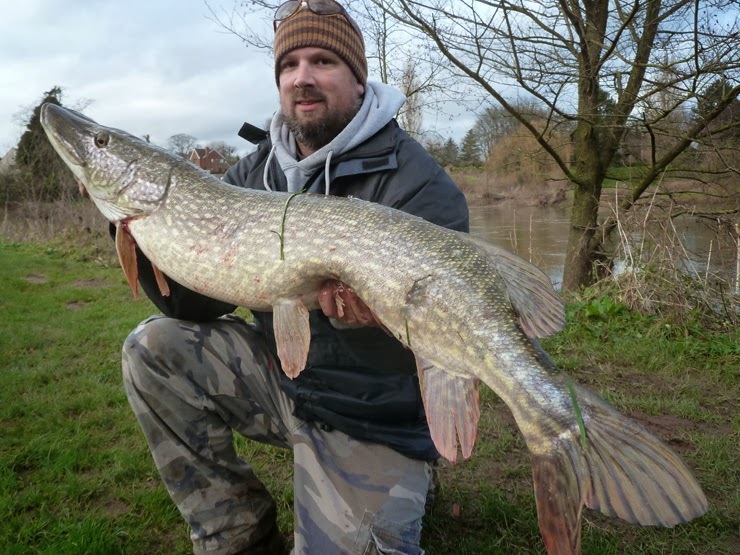 A brace of mid-doubles in pretty crap conditions. Top stuff! I had my chance to add a double to the bag, losing a good fish to a hook-pull - it wasn't my day! The brief feeding spell was over, but we still fished on through the rain into the dark - great result in those conditions. The river rose about a foot after we left but a frost overnight saw it back to about the same level by the following morning. It was still cold, unsettled and I have to be honest I didn't really fancy it, but Paulos couldn't fish and Roger has been rendered a spectator with a bad leg - he's been out for a month or so, and the rest of the season. My train back to London wasn't until this evening so I hit the water - you can't catch them sat at home! Restricted to the same few slacks I had runs on ledgered livebaits and deadbaits, aggressive hits but the pike (or whatever) were almost instantly dropping the bait - weird. I did hit a fish on the tiniest of runs, a good scrap and a nice double - which as it slid over the net I recognised as the 16lb 1oz pike from yesterday - it's been a tough few days, I'll take it! Until next time River Wye, until next time! What a great day (for me!). Bad timing and an unlucky hook pull, that's fishing. 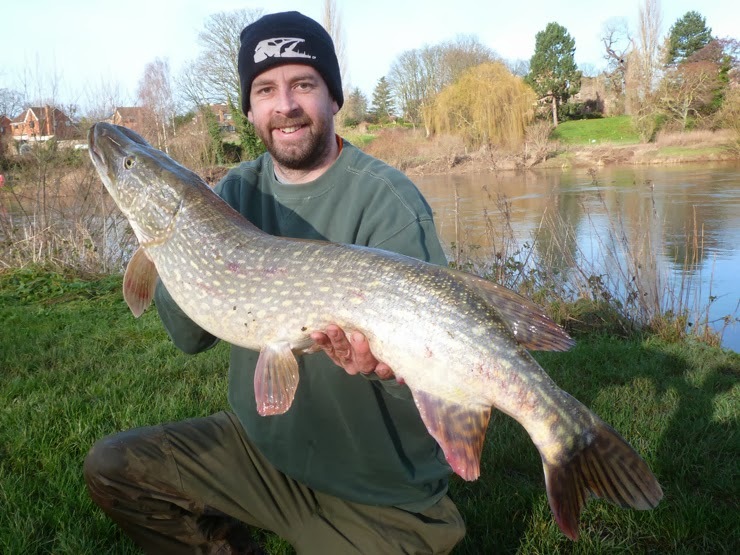 Great to be back on the Wye after a couple of years break. You had a great day - hope there's at least another one before you have to go back to shark land! Have had quite a few hook-pulls this season, haven't changed brand of hooks - don't know if I'm doing something wrong or I'm just having an unlucky streak. Unlucky streak Brian, happens to everyone!, but yourself and Paulos caught in those conditions for me at least that is seldom achieved so a big well in and you are chewing into my lead. Again well in mate.